There are the little hatchbacks and there are the luxurious sedans and then there are those cars we call SUVs or MUVs. While hatchbacks maybe easy to drive around and park and sedans might radiate class but it is ultimately the bigger and spacious beauties that can carry a big clan together. Here is a low down on some popular big-clan cars. The Tata Safari comes with a 2.2L, 16-Valve VTT DICOR engine capable of producing 140hp at the rate of 4000rpm and torque of 320Nm at the rate of 1700-2700 rpm. Safari has tubeless tyres, day-night instrumental panel, wood finish center console, leather seats, power windows, leather wrapped steering and gear knob and the headlamps stay lit-up for nearly 30 seconds after the ignition is turned off. The safety features include ABS, dual Airbags and reverse guide system teamed with crash safety features. 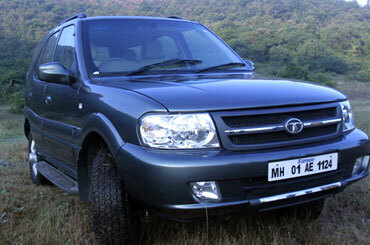 Safari comes with a split grille and badges on them, body coloured bumpers and new hard covers for the spare tyres. In a crowded parking lot you can spot your Safari from a distance as the car's remote unlocking system lightens the roof of the car for five seconds thus helping trace the car. Innova is available in both petrol and diesel engine options. It has a 1998cc, 16-Valve DOHC WTi petrol engine capable of producing 132PS power at 5600rpm and 181NM torque at 4000rpm. The car's diesel engine is a 2494cc, 16-Valve DOHC that produces 102PS power at 3600rpm and 200NM torque at 1400 -- 3400rpm. 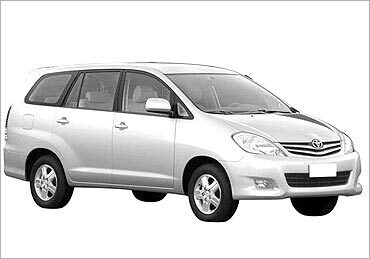 The good thing about this family transportation vehicle is that the Toyota Innova's petrol variant is also compatible with CNG and comes with a manual selector switch that enables the driver to easily switch from gasoline to CNG and vice versa. The CNG cylinder present in the car has a capacity of 12kg and the running cost comes around Rs 1.6/km or less depending on the driving situation. 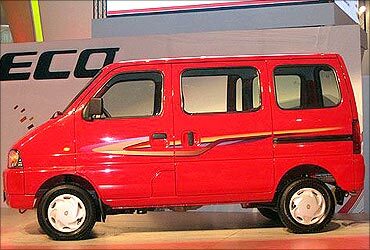 After the Omni van and unsuccessful Versa Maruti came up with this very affordable and perfect big family car. The car has a 196cc petrol engine that generates maximum power of 73 Bhp at 6000 rpm with the maximum torque of 101 Nm at 3000 rpm. Maruti Echo is available in six appealing colours -- metallic midnight black, metallic blue blaze, bright red, metallic glistening grey, metallic silky silver and superior white. The Maruti Eeco has dual tone interiors and a digital meter cluster along with sliding doors similar to Omni. The Mahindra Xylo comes with a diesel engine that has a displacement of 2500cc and produces maximum power of 110 bhp at 3200 rpm and 28.3 kgm of torque at 1700 rpm. Xylo comes packed with a rack type steering adjustment, adjustable driver seat, MP3 CD player, parking sensors, fog lamps and also rear seat belts and has buttons and controls on the steering. The Mahindra Xylo comes with a five-speed manually operated gear option and flaunts body colour bumpers, tachometer, alloys, ORVM indicators, climate controlled AC, power windows, remote controlled central locking, remote operated fuel filler, rear wiper and rear defogger. This one is as popular in the cities as in the rural heartland. 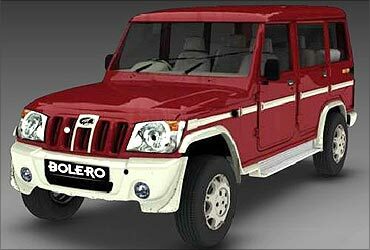 Bolero is truly made for Indian roads and can easily cruise on the pothole ridden Indian roads. The Mahindra Bolero has a 2498 cc diesel engine and comes with a 5-speed transmission. 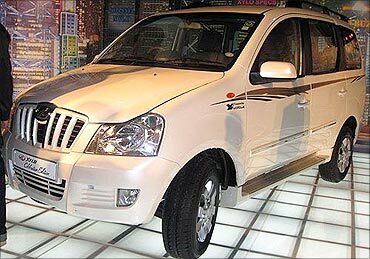 The car is a fuel efficient one and has features like antisubmarine seats, air conditioners, power steering and four speaker music system. 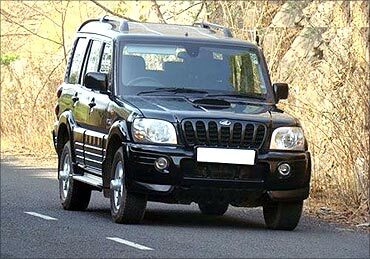 This popular SUV by Mahindra has a 2600 plus DI diesel engine capable of generating 109 bhp of power and 26 kgm torque. While the petrol version has the 116 bhp engines from Renault. The Scorpio has a number of good features and the car's front grille now has a glint of silver in the middle. Scorpio's bonnet scoop gives the car its must coveted aggressiveness. The car also has dual tone ORVMs that are electrically powered, the rear footstep seamlessly integrated with the rear bumper, multi-focal headlights with a unique 'Sunrays' reflector design, sporty fog lamps, tubeless tyres, collapsible steering column and side intrusion beams, fire resistant upholstery and voice assist system. This has been a popular car but now it is only available in BIII compliant cities. Tavera comes with a 2.5-litre direct-injection turbo-diesel capable of producing 80bhp. 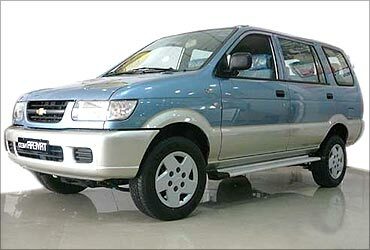 The Tavera is a nice blend between an SUV and MUV with it's the boxy shape short, sloping bonnet. It has 15-inch alloys, and smooth styling. Overall, this is a no hassle frill free car. Chennai, the Detroit of Asia?